If you are looking for high quality rental cars that are reasonably priced, then VroomVroomVroom is the best site to check out. Our car hire experts have carefully handpicked the vehicles offered by the country's leading suppliers including Avis, Hertz, and Europcar so we can provide the best deals. The suburb of Subang can be found in Selangor's Petaling District in Malaysia. The place is known for the beautiful village in Klang Valley called Kampung Baru Subang and the 18-hole golf course of Saujana Golf and Country Club. If you are flying to Subang, you will probably be arriving via Sultan Abdul Aziz Shah Airport or also known as Subang Airport. It used to be Kuala Lumpur's main international airport, but now it is the hub of Firefly, Malindo Air, and Berjaya Air. To get easy access to Subang and other major cities and towns nearby including Kelana Jaya, Subang Jaya, Sungai Buloh and Kota Damansara, it is advisable to hire a car. If there are no rental cars available in the suburb, you can check out Sepang, Selangor which is approximately an hour away from Subang via AH2, Route 29 or E2. Here are other reasons why more people have been using our site. Free to book and cancel. No credit card details needed to book. Friendly customer care experts. Feel free to contact us if you have any queries. Subang has a tropical wet climate which means that you can expect rain in the city all year round. In fact, it is the most thunderous place in Malaysia based on a study conducted by the Malaysian Meteorological Department. The warmest month is March with can reach up to 33 degrees Celsius while the coolest month is November which could drop up to 24 degrees Celsius. Make sure to bring your raincoat or umbrella when you visit Subang. Many people flock to Selangor during theThaipusam festival which usually falls in January or February. You can witness penance rituals such as skin piercing and skewering during this famous Hindu festivity. If it is your first time to visit Malaysia, one thing to remember is that cars here are right-hand drive which means that you drive on the left side of the road. Foreigners need an international driver's license to rent a car in the country. Purchasing a Touch 'n' Go card can make your travel easier since you can use it to pay for the toll fees (and there are quite a lot in Malaysia) and parking in selected shopping malls. Since it is usually raining in Subang, try to avoid passing by a tunnel or under a bridge when it is raining hard since riders commonly park their motorcycles there to avoid getting soaked. Apart from the golf courses and premier residences in Subang, there are other attractions nearby that are perfect for the whole family. Since the suburb is just around 5 to 10 minutes away via hire car to Subang Jaya, visitors will have easy access to many wonderful places. We at VroomVroomVroom want you to experience the best of Subang that's why we have listed down some of the fun things you can do, and the best places where you can stay and eat in the area. We hope this will save you up some time from making your itinerary. Do you feel the need for speed? 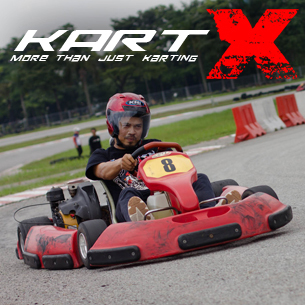 KartX can make you feel like a pro with its first-class rental karts and circuit. You can race with your friends and family or join their monthly race event called Battle of the Best. Participants need to be included in the top 50 in the previous month to be eligible to join the tournament. If you wanted to go there for a quick race, make sure to check for closures and special events or better yet call them up to reserve a slot. There are around 250 retail shops in the 12-storey tower which is perfect for shopaholics and even to those who are looking for a place to unwind. Apart from the shops, you can also find the biggest rooftop restaurant in Malaysia at Sky Park. The Sky is a perfect place to wine and dine while enjoying spectacular views of the city. If you are in the mood to watch some movies, there's no need to go any further because the Premium X Cinemas can also be found in the mall. Whether you are travelling for business or pleasure, the Empire Hotel can provide you a comfortable stay in Subang. They offer luxurious rooms equipped with first-class amenities for the sophisticated travellers. The boutique hotel has meeting rooms and function rooms that will suit all occasions. There are also several dining and drinking options in the hotel. If you are looking for places to shop, the Subang Shopping Centre and Empire Shopping Gallery are within easy reach. Known for its superb location, travellers staying at Dorset Grand Subang will have easy access to major tourist attractions, entertainment venues, and shopping district. The hotel is just around 15 minutes away via hire car from Kuala Lumpur City Centre and 35 minutes away from Kuala Lumpur International Airport. There are 478 rooms and suites to choose from that offer breathtaking views of the lush gardens and modern city. After a tiring day, guests can take a dip in their swimming pool or enjoy some relaxing treatment at the Tanjung Wellness Spa. They also have a fitness centre, business centre, premiere lounge, restaurants, and café. If you are craving for Italian food while in Subang, then make sure to try out the pasta, pizza and vino at Italiannies. They are known for their signature sauces and bread doughs that were made fresh every morning. They already have 7 branches in Malaysia since they launched in 2004. The one in Subang is conveniently located at the ground floor of Empire Shopping Gallery. You can enjoy a nice Italian dish with a modern twist after doing some shopping. The best fish ball noodle specialist can be found along Persiaran Kewajipan which is one of the busiest roads in Subang Jaya. People have been flocking to AK Noodles House to get a taste of their delicious and crispy fish balls. It has no preservative which makes it ideal for the health conscious. Make sure to also try their other specialties including the Curry Laksa Noodle, Curry Yong Tau Fu and Crispy Fish Cake. They also offer Steamboat Packages for those dining in groups.